Please welcome our guest author, Sara Rosett, whose novel GETTING AWAY IS DEADLY, her third book in the mom zone mystery series about a military spouse who runs a professional organizing business, comes out this week. Sara might be slightly in touch with her protagonist’s heart, being a military wife herself, though the comparisons stop when murder comes into play. SR: Ellie Avery, a military spouse and professional organizer, accompanies her pilot husband to a training class in Washington D.C. She wants a little r&r in the form of sight-seeing and shopping, but her getaway turns deadly when she witnesses a murder in the Metro. DB: What got you writing in the genre in which you write. SR: I’ve always loved mysteries. I grew up reading Nancy Drew and Trixie Beldon. I moved on to romantic suspense and devoured novels by Elizabeth Peters and Mary Stewart. Then I found mysteries by contemporary female writers like Carolyn Hart and Margaret Maron. Their books had modern “everyday” women as the main characters in American settings. I decided to attempt to write an amateur sleuth mystery with a mom as the protagonist. The result was the first Mom Zone Mystery, Moving is Murder. 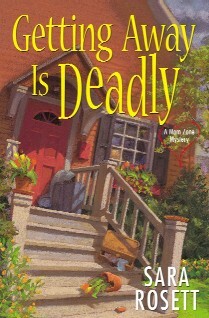 Getting Away is Deadly is the third installment in the series. SR: I love meeting readers and booksellers. It’s so nice to connect with people who love books as much as I do! And I have to say it’s also pretty cool to open a box and see stacks of books with my name on the spine. SR: The day-in-day-out slog of writing the first draft, which is the hardest part for me. Once I actually get something down on paper I feel so much better. Revision is easy compared to the first draft. SR: At one of my first book signings, a man asked me if he could have a kiss. I was thrown for a moment, until I remembered the chocolate kisses I’d put out to draw people over to my signing table. I guess they worked—maybe a little too well! DB: Speaking of food, I like to ask guests this: What’s your favorite type of pie? hi Sara! Thanks for coming by today and best of luck with your new release–sounds like a lot of fun! I will have to get the book because her dessert choices are second to none. Trixie Belden!!! I forgot all about her but I read a whole bunch of those as a kid. Thanks so much for coming to The Ball! Thanks for joining us today, Sara! Your series looks great! Congratulations and I’m also more of a chocolate cake kind of girl! Thanks for coming by! I was a Nancy Drew girl too. I would be interested to hear how much pre-plotting you do when writing a mystery. I’m guessing with mystery it would be far more difficult to fly by the seat of your pants. Can you tell me more about your process? I used to LOVE Trixie Beldon. And like Eileen, I would love to also know how much pre-plotting you do! Looking forward to hearing more on this! I have to say, banana cream pie sounds pretty good, Jenny. Nice to know there are other Trixie B. fans out there, Danielle. I know some mystery writers who seem to just *know* how to write a good mystery, but it didn’t come instinctively to me. I read mysteries for years. It was my favorite genre and it seemed that the more I read, the more the mist began to clear and I could see how a mystery was structured. Jess and Eileen want to know how much pre-plotting I do. Quite a bit. I usually start with an incident, a “what if” moment. In the case of Getting Away, it was what would happen if someone was pushed off the Metro platform? After I have the incident, I begin to figure out the major players: the victim and the suspects. I have to work out who committed the crime and then think about what other people would also want that person out of the way. I don’t do an outline, but I do take a large sheet of butcher paper and write a rough timeline for the story across the bottom, then I layer in the different subplots. Eventually, it looks pretty messy, but it does let me get all my ideas on paper and I can draw all sorts of lines linking different people and situations to help me remember my initial ideas. Sometimes the book evolves and changes as I get down to writing it and other times it doesn’t. I like the graphic organizer approach because it lets me scribble all over the place and then put everything in coherent order later. I do know other mystery writers who write by the seat of their pants and just figure it out as they go along. To each his own!